When a couple with children from their previous marriages decide to get married, it can be a huge adjustment for everyone. Both gain a new marriage partner, plus a number of children. The children have stepsisters and -brothers whom they must learn to understand, and a new figure of authority whom they must take into account. The excitement that the happy couple feels is not always shared by the children. There are ways to facilitate the transition. Begin with open community channels. Each one must feel he has a voice, and that he is heard. Involve the children in decision-making whenever possible. Give the children time to adjust, and don’t become impatient. Even if you give your stepchildren a lot of your time, energy and love, it does not mean to say that they will react positively towards you. Let go of your expectations and see your goodness as seeds you are sowing in your relationship. Never expect your new marriage partner to choose between you and his children. This will only destroy relationships and create grudges. You cannot insist that your children like one another and get on well, but you can insist that they treat one another with respect. Balance is important. Don’t focus on keeping the children happy to such an extent that you forget to work on your brand-new marriage. On the other hand, don’t be so lost in your loved one’s arms that you forget to build a relationship with the children. Don’t enforce big changes from the outset. Remember that the children are used to doing things in a certain way, and will become completely confused if suddenly their world is turned totally upside down. Eat together as a family. Mealtimes can create wonderful opportunities to chat and get to know one another better. Create new family routines and rituals. This will help to unite the family. Discuss the role of the step-parent. Let him take on the role of friend and councillor for his stepchildren. Let the biological parent enforce the rules. The step-parent will in time take on the role of parent to a greater extent, as the relationship grows and strengthens. Make sure everyone knows what the rules are and that they apply to everyone. Write them down and attach to the fridge door. No confusion should be created as to what is acceptable. Children feel safe within clear boundaries. Involve all parents. 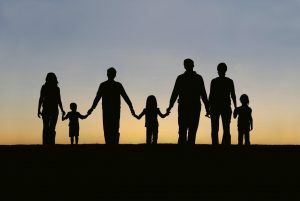 Both biological parents must be part of their children’s lives and cooperation must be established. Children will adapt better in the blended family if both parents are part of the process. Take care not to treat your stepchildren better than your own children in an effort to win them over. It is a bad idea to overcompensate. Allow your spouse to spend alone-time with his biological children. Join a support group. You don’t have to go through this big adjustment alone and without advice. There are enough blended families who adapted successfully after difficult times and who can assist you in word and deed.